Everyone knows that there’s been a slow start to the European winter. Maybe even more precisely an Eastern Alps “issue”. 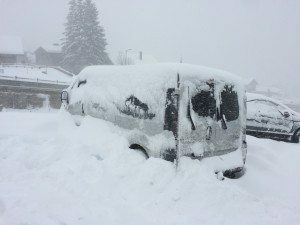 As the holiday period started, a small snowfall fell, opening up many of the higher resorts. The last time I posted was after a trip to Tignes and it wasn’t possible then to ski back down to the town of Le Lac. They profited and other resorts stayed closed for the Christmas week. In Chamonix, we’re relatively lucky having the mecca of the Grands Montets – North facing and starting at 1972m on our doorstep! 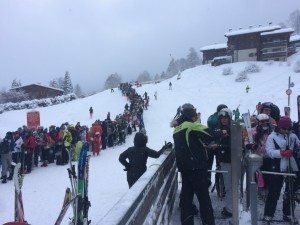 The next morning the busiest week of the season starts and at Les Houches it was……NUTS to get tickets as no-one had pre-booked due to lack of snow.